All Nissan automobiles are engineered with a reliable and durable air conditioning system that is responsible for taking in warm ambient air, conditioning it, and sending the colder air through your ventilation system to cool down the cabin. This makes your Nissan Air Conditioning System pretty important for your driving comfort on warmer California days unless you like sweating profusely in a sweltering vehicle as cabin temperatures easily soar above 100 degrees. If you like a nice cool cabin on warm days then getting a regular Nissan Air Conditioning Service is one of the best ways to stay cool while driving in California’s heat. You know if you’ve lived in the San Diego region for long that the average winter temperature in the area is usually pleasant, but daily highs above 80 degrees happen in January every year. Temperature records suggest that San Diego will have at least 1 day in January with a high over 80 degrees and at least 7 days between 70 and 80 degrees. These are the days that you will get into your Nissan vehicle and want your air conditioning system to deliver cold air. The best way to know that your Nissan Air Conditioning will function as you expect is to have service regularly to ensure it is operating at factory specifications. As you can see, the limiting factors for a do-it-yourself air conditioning service are finding the root cause of the problem and then knowing how to fix it. 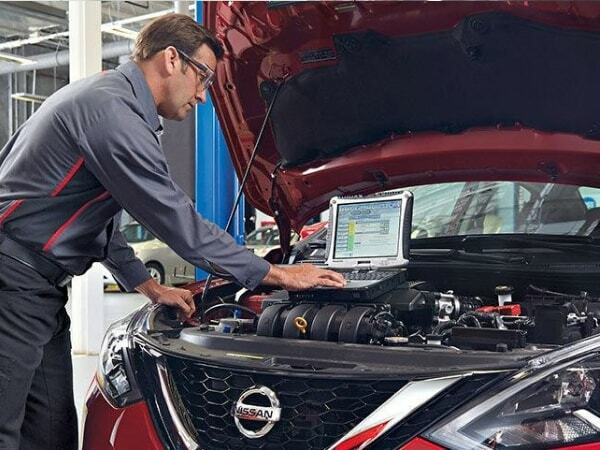 The team of Certified Nissan Technicians at Lang Nissan at Mission Bay have specialized diagnostic tools and a genuine service protocol to identify the primary cause of system underperformance, clean the entire system, and repair it as needed to restore your Nissan Air Conditioning System back to factory specifications. You’ll know when you leave the service center that your Nissan Air Conditioning System is totally ready to deliver cold air when you need it most. If you drive a Nissan and live in San Diego, Pacific Beach, Ocean Beach, Chula Vista, or La Mesa, then you have a perfect opportunity today to schedule service and get the most reliable Air Conditioning System. Lang Nissan at Mission Bay is now offering a Nissan Air Conditioning Service that will restore your A/C to factory specifications. Nissan Air Conditioning Service is always a good idea at the end of summer if you want to know that your A/C is ready at all times.